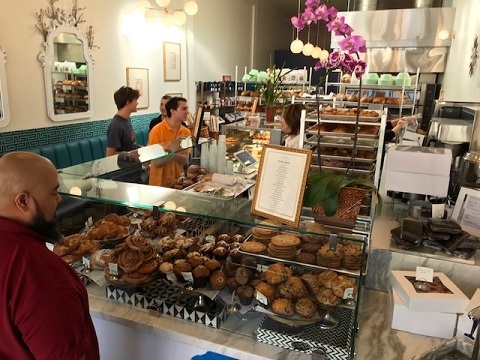 Claremont’s had a good bakery going back decades: Hodges, Jensen’s and then Some Crust, perhaps the quintessential Claremont Village business, where you can get not only very good pastries, breakfast sliders and coffee but a sense of Claremont. 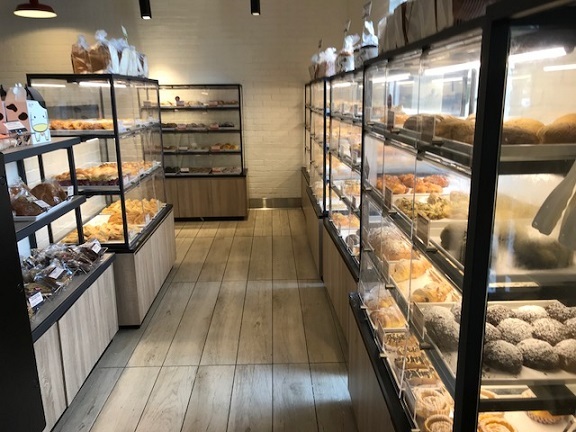 Now there’s a second bakery in the Village. 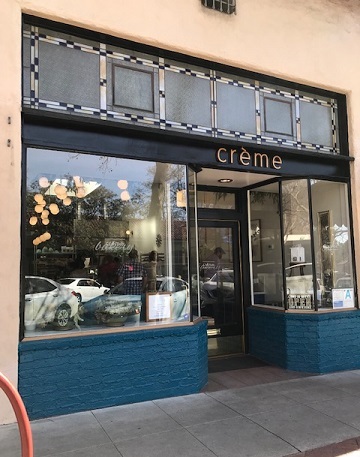 Creme opened last September and has quickly established itself as a formidable presence one block east of Some Crust. 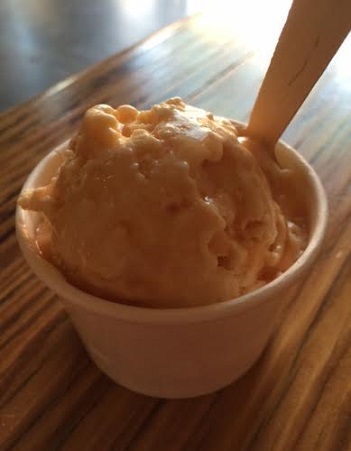 A frequent customer of the latter, I’ve begun gravitating to Creme. 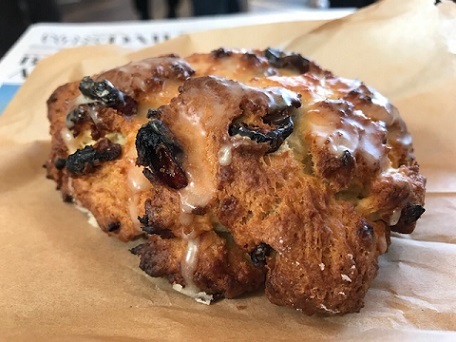 It’s the product of a retired Whole Foods executive and enthusiastic baker, Erica Hartig Dubreuil. 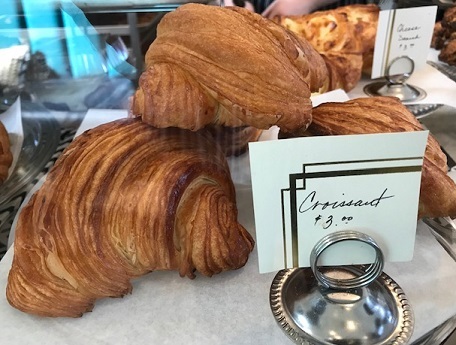 You’ll know right away it’s a French bakery from the genteel atmosphere, the lovely displays and the emphasis on croissants, scones, tarts and baguettes. 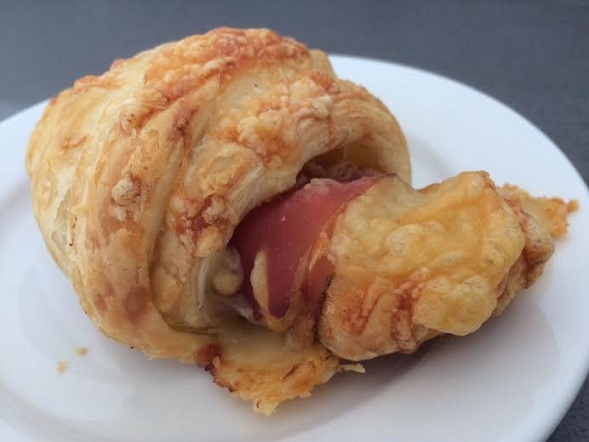 The croissants are superb, the slight crust of the exterior yielding to a pliable interior. 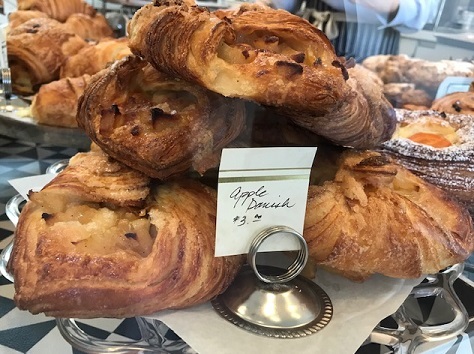 The apple danish is lightly crunchy and chewy, with a generous amount of apple. 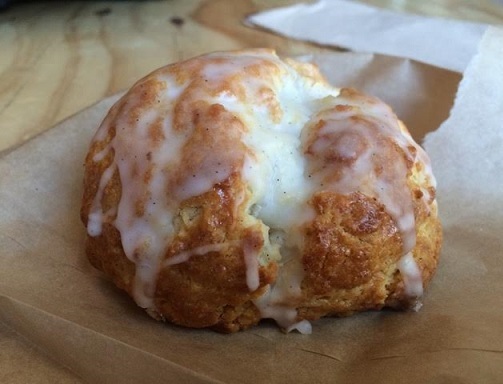 I’ve also had a cranberry orange scone, dense and sweet, the first item I tried, and a ginger scone. I wouldn’t mind working my way through all the offerings. 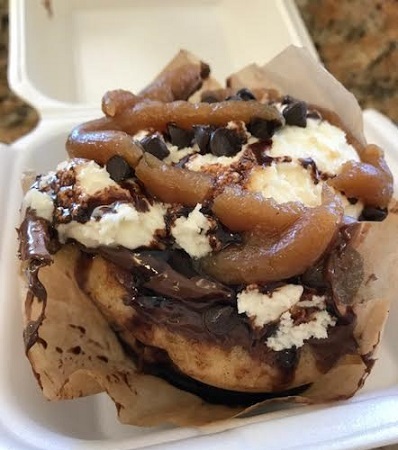 The only item so far that I’ve been indifferent toward was the vegan blueberry muffin, which stuck to the paper. 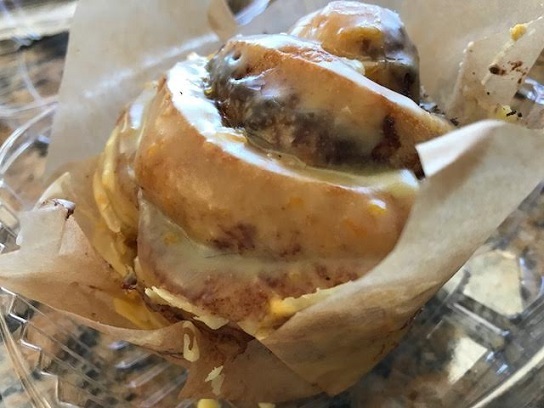 I do think Some Crust does vegan muffins better. 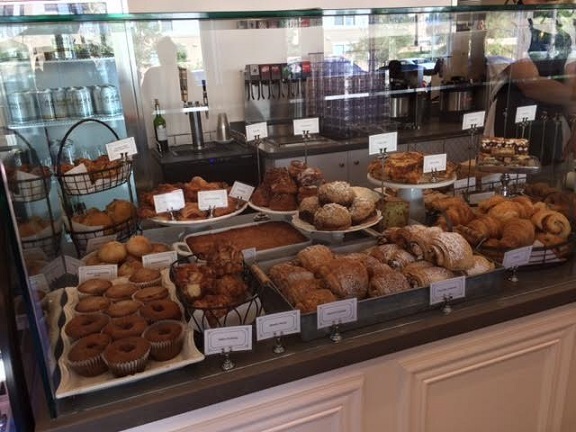 Morning buns, muffins, scones, cookies and more will face you when you enter. 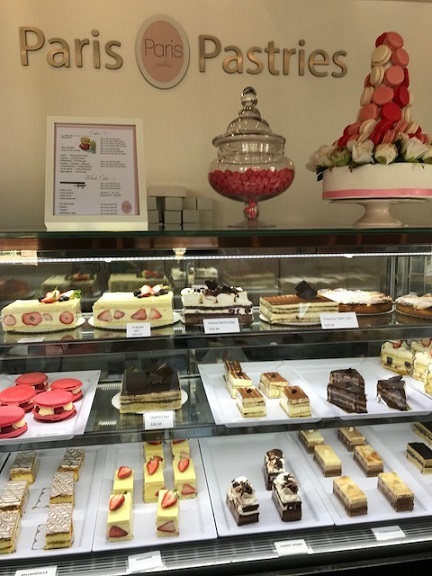 Creme has a few coffees, baguette sandwiches for lunch, a case of elegant tarts and more. Seating is at a long, L-shaped communal sofa with the occasional tiny table. You won’t stay for hours, or bring a group, but you can meet with or bring one or two people, or just sit and people watch or, as I do, read a newspaper. 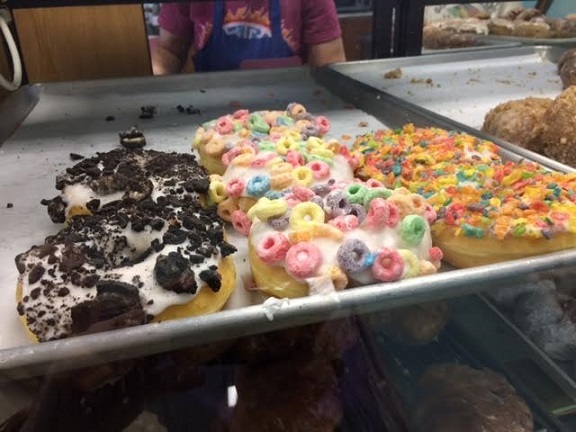 Is the Claremont Village now popular enough for two bakeries? 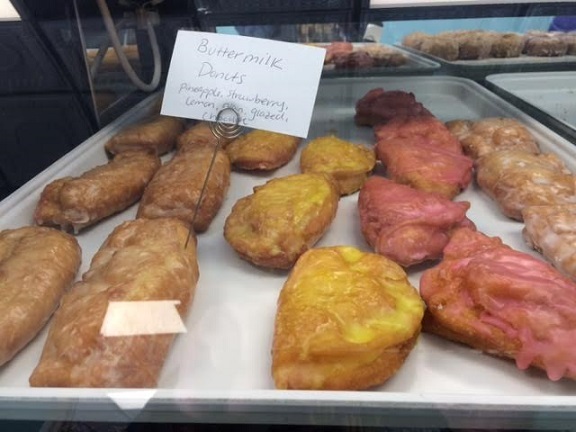 I hope so, because I love Some Crust, and I’m quickly coming to love Creme too. 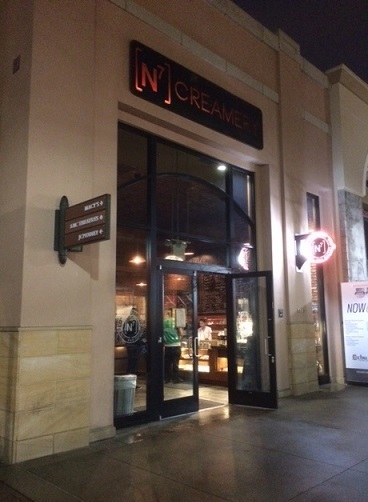 I still think of this corner spot in the Chaffey Town Square center as Pei Wei, although it’s been a restaurant or two since the Chinese fusion place left. 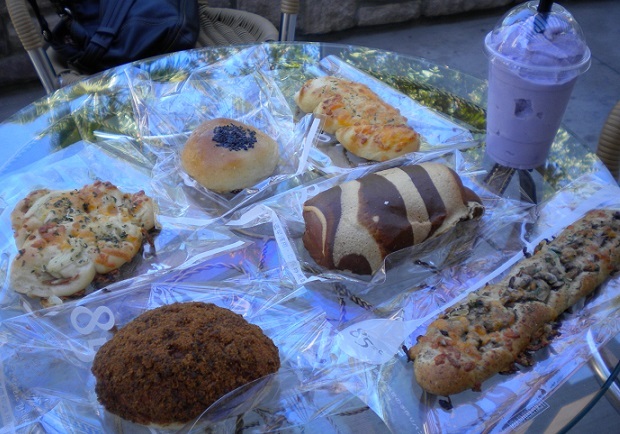 It’s been Paris Pastries for a couple of years now. I made it in earlier this month for a weekday lunch with a Francophile phriend, er, friend. 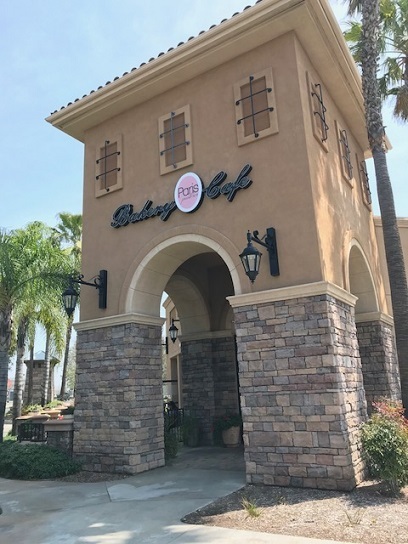 My visit was prompted by reader Charlene Comeaux, a regular there, who emailed to tell me the owners moved to Rancho Cucamonga from southern France, are fluent in French and thus serve authentic French cuisine and baked items. 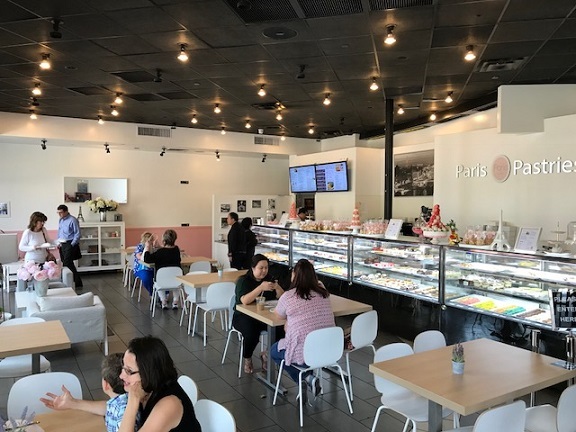 Several of the patio tables were taken, a nice sight, and inside the restaurant was being enjoyed by several more, so maybe Paris Pastries is catching on. 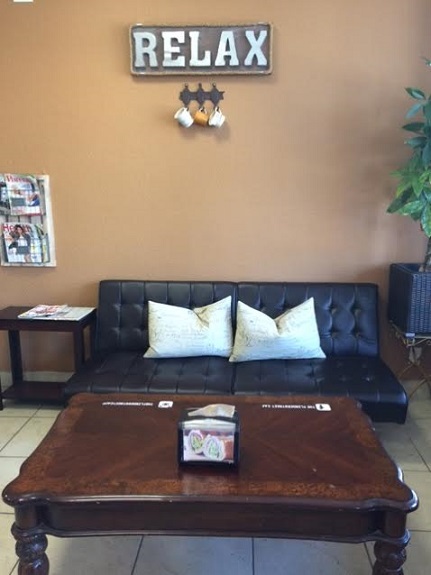 Besides the tables and chairs, there’s a sofa, which was occupied and gave a homey touch. 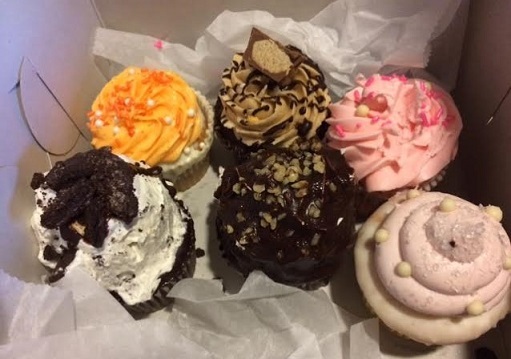 The dining room was decorated in pastels, and a long bakery case offered enticements: macaroons, cakes and more. You order at the end. 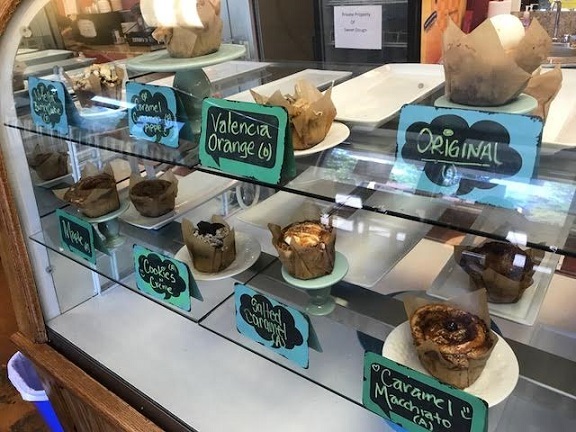 The menu is short, with a couple of salads, a few sandwiches, quiches, plates and crepes, plus coffee drinks including espresso. My friend had been here a couple of times before for croissants on weekends but had not had a full meal. 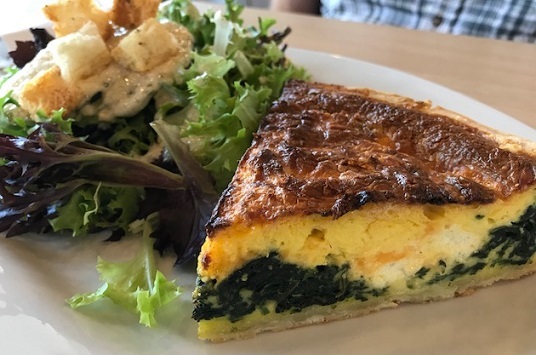 He ordered the quiche combo ($11): a spinach and goat cheese quiche, a salad and a drip coffee. He pronounced himself satisfied, if not quite transported to the French countryside. 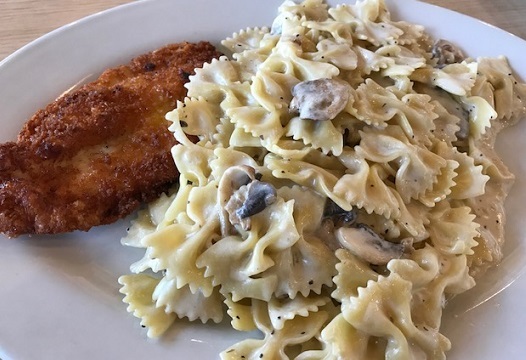 I got the crispy chicken pasta ($10.49), with fried chicken breast, pasta, cream sauce and mushrooms. 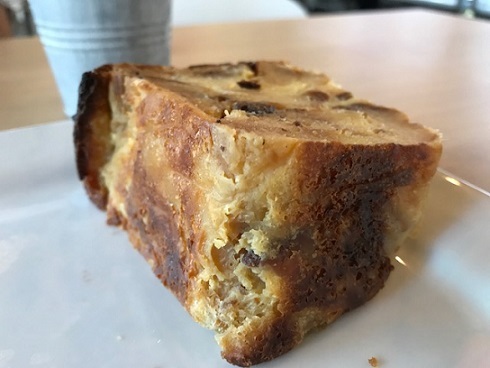 This was plenty filling, and the bread pudding I ordered ($4) about finished me off. But I finished it off first. 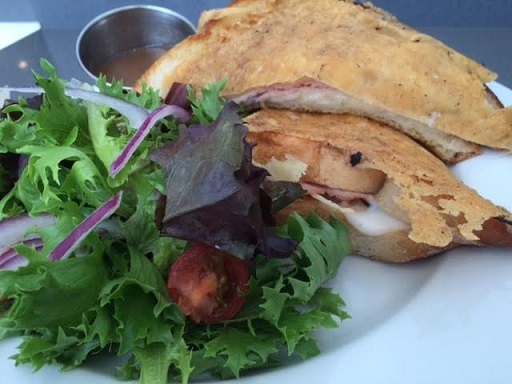 It’s a cute place and one of the very few spots locally with French cuisine. 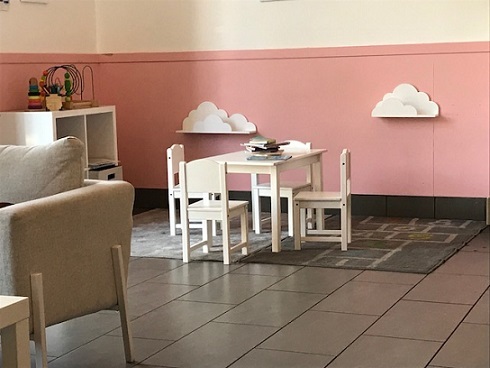 Mention should also be made of the little corner designed for children, with a small table and chairs, books and play objects. I found it adorable — which I’m mentally saying in the French way. 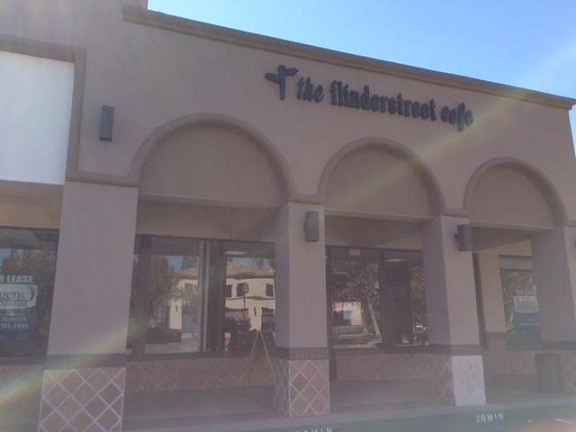 The Flinderstreet Cafe, 5483 Philadelphia St. (at Central), Chino; open weekdays 10 a.m. to 8 p.m., Saturdays 11 a.m. to 8 p.m., Sundays 11 a.m. to 6 p.m. 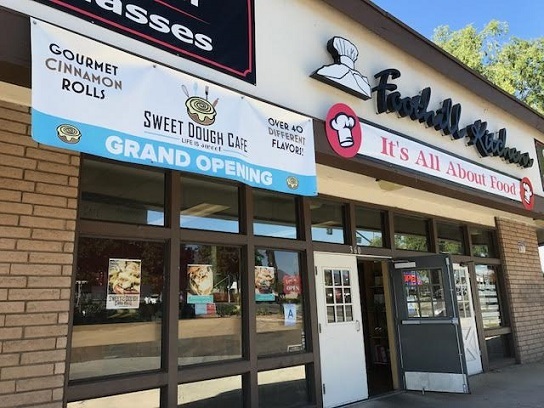 Apparently named for a street in Melbourne, Flinderstreet Cafe is located within Chino Town Square shopping center just above the 60 Freeway. It has a Target, Burlington, laser tag and more, but also some empty storefronts. 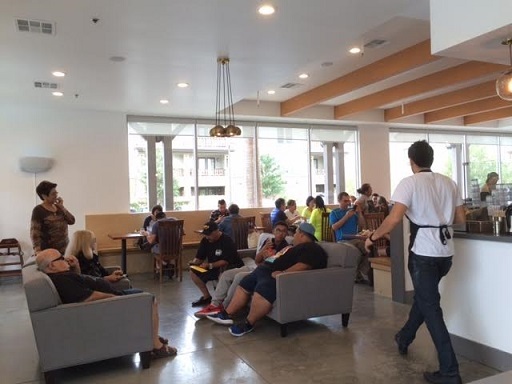 It’s not where you would expect to find a cute, locally owned cafe, but there it is, open since November 2015. I wouldn’t have known Flinderstreet existed except for a friend. I invited her to meet me for lunch since she’s a regular. 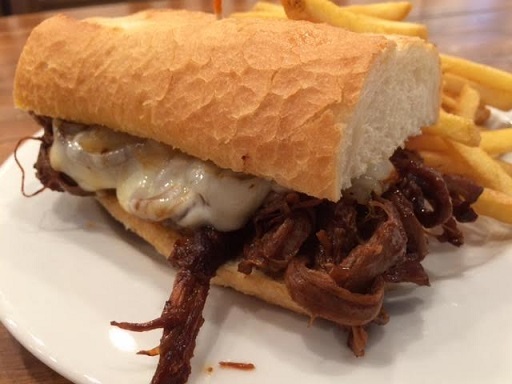 Inside, there are high-top and standard tables, plus a sofa under a sign reading “Relax.” The menu has sandwiches (grinders, paninis, wraps), pasta, salads and, reflecting the cafe’s Down Under inspiration, an Australian meat pie. 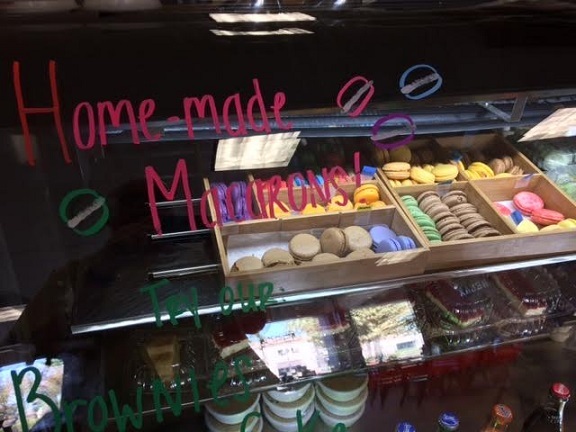 They make coffees and teas, and a few bakery items, including macarons ($2). 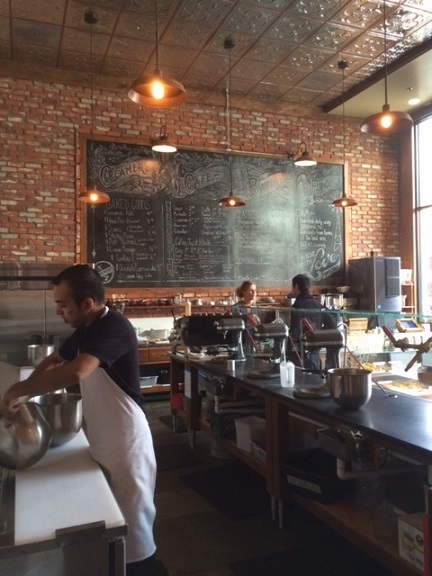 The pricing is simple: all pastas are $7.50, grinders $8.50, paninis $8.90, for instance. 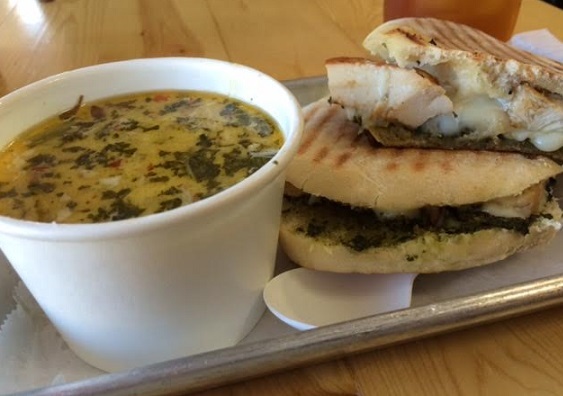 I got a chicken pesto panini. Side choices were housemade chips, salad or, with a small upgrade, soup; I went with the soup. (With iced tea, the tab was $14.47.) My sandwich was okay, my soup, Toscana, better. 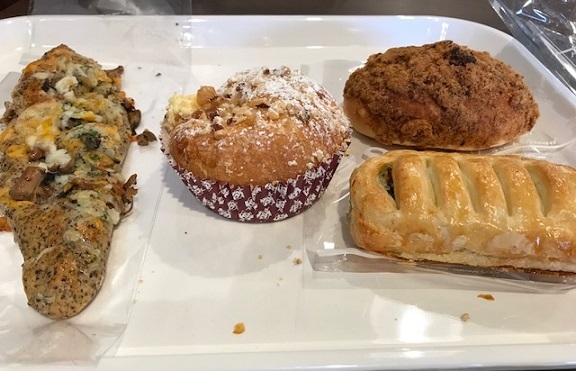 My friend got a vegetable panini with salad and liked both, and an iced latte ($3.50). 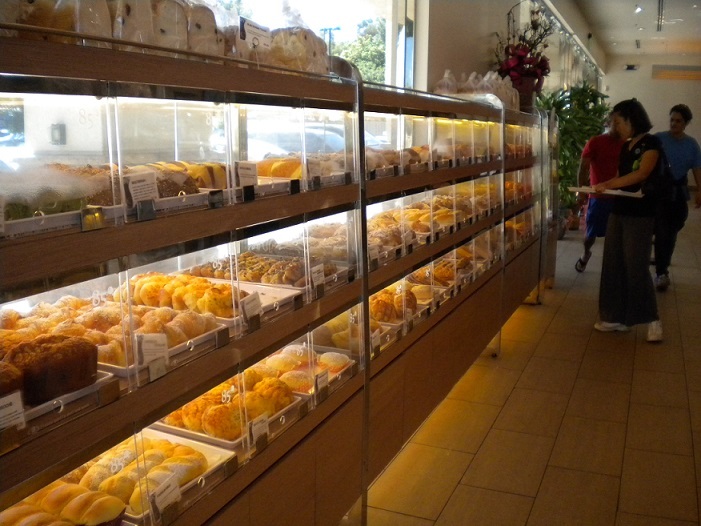 You order at the counter, but after we sat down, an employee came by with a basket of cookies, for us to pick one each. I took ginger snap. “They always greet you with cookies,” my friend confided. Now who wouldn’t like a place like that? It’s tough enough to get greeted in a restaurant, much less with cookies. 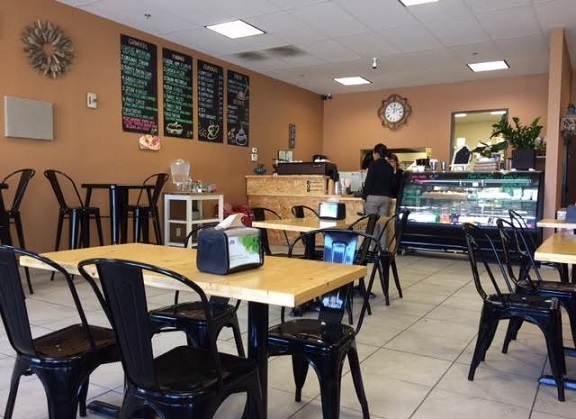 At this writing, the cafe has just more than 300 reviews on Yelp and a five-star rating, not an easy feat to pull off. Flinderstreet is worth the effort to find it. 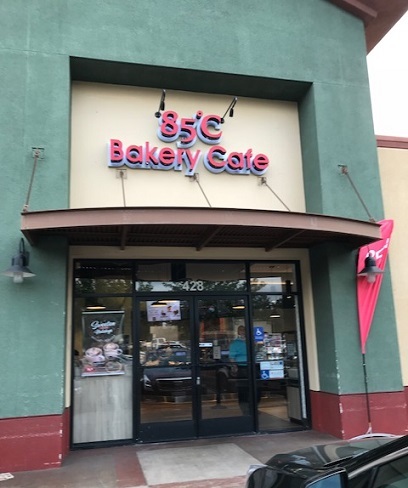 Sometimes called the Starbucks of Taiwan, 85 Degrees Celsius has been sprouting in Southern California’s Asian enclaves, with locations to date in Irvine, Hacienda Heights and West Covina. 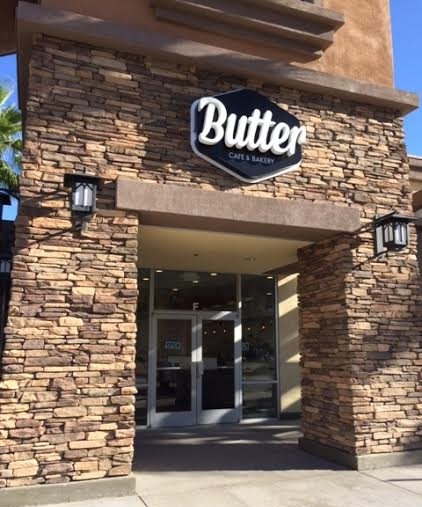 A Chino Hills outpost opened in July. 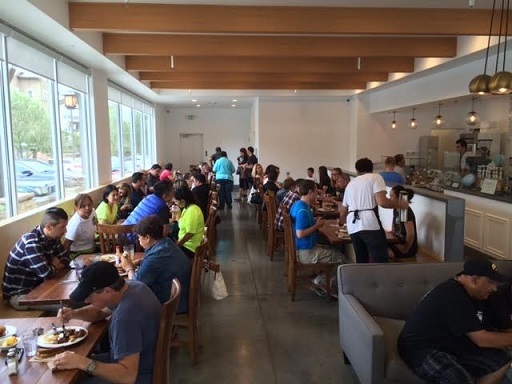 It’s the largest at 5,000 square feet and took over the defunct City Broiler. 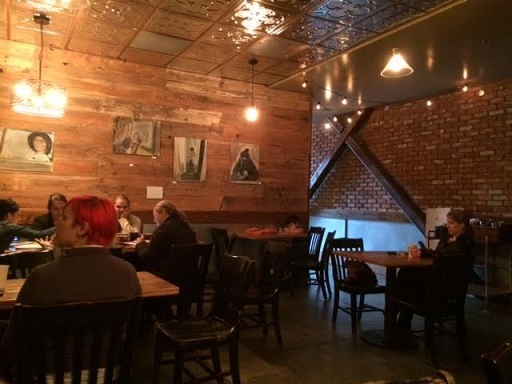 It’s been radically transformed, with lots of windows and lots of seating, as well as a shady, pleasant rear patio. I met a friend for lunch who had previously shown me the one in West Covina, so I knew what to expect. 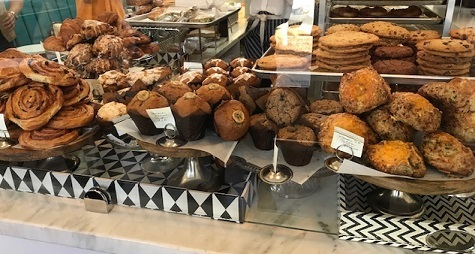 Breads and pastries, both savory and sweet, are displayed in clear plastic cases, from which you pluck whatever you want with tongs and place them on a cafeteria tray. 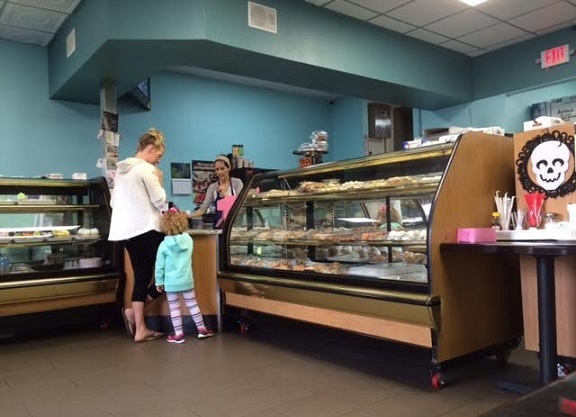 If you’ve been to a panaderia, you’ll recognize the concept. When you pay, each item is put into a clear bag. They also sell coffees, smoothies and other beverages. So it’s basically a bread buffet, a carbohydrate cafeteria. 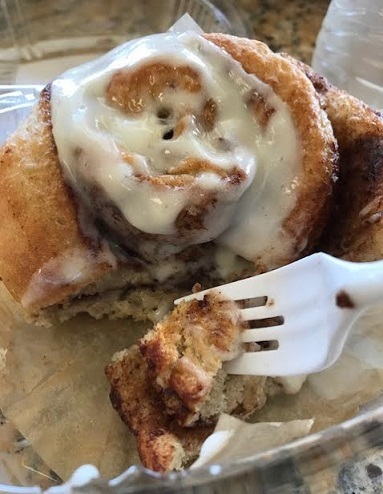 Three pieces will generally fill you up. We had a pork sung bun, wheat germ mushroom, garlic cheese, and ham and onion roll, with red bean bread and mocha bread for dessert. Each was from $1.10 to $2. I also had a taro slush drink ($3.75). 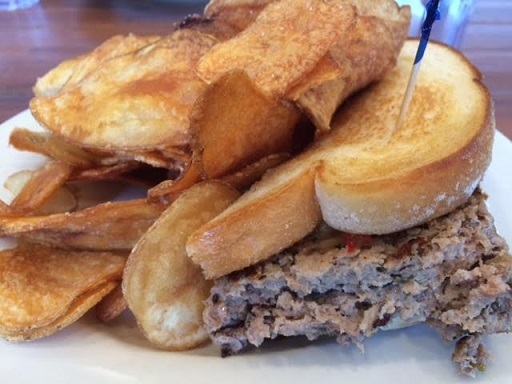 So, two of us had a satisfying lunch for $13, and I saved the mocha bread for breakfast the next morning. It was too bready for me, and the pork sung bun, essentially a bun dusted with powdery pork, was too dry for my taste. The rest were delicious, and I liked my drink too. 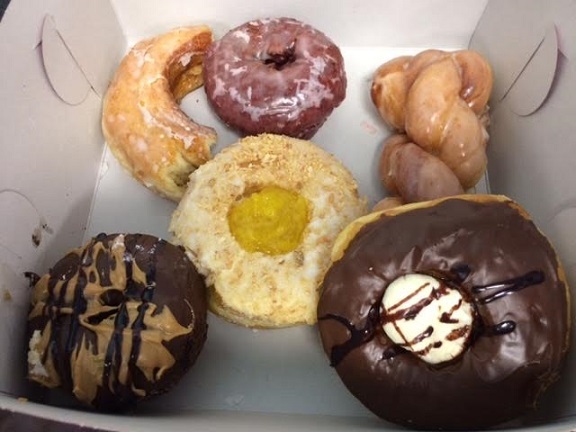 Definitely worth a visit: The items are different and really good (people rave about the sea salt coffee too), and as there will be more 85 Degrees locations, you may as well try one now so you can brag to your friends when one pops up in, say, Rancho Cucamonga that you already know all about it. 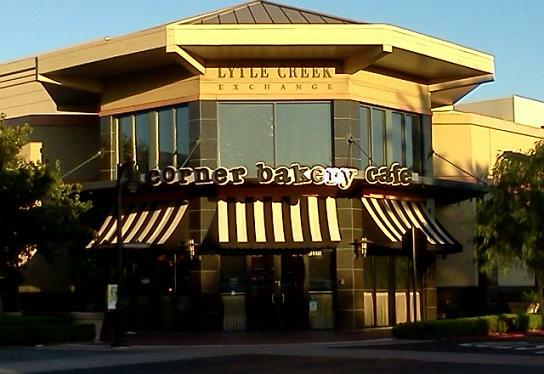 Corner Bakery is a chain, but one with only two Inland Valley locations, fewer than some of our mom-and-pop restaurants, so it’s fair game here. 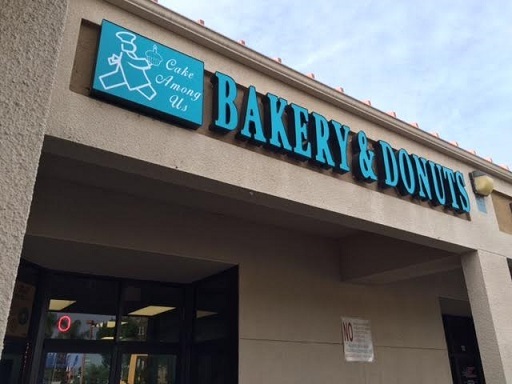 I haven’t been to the one in Chino Hills (4517 Chino Hills Parkway) but over the years I’ve been to the Victoria Gardens location many times. 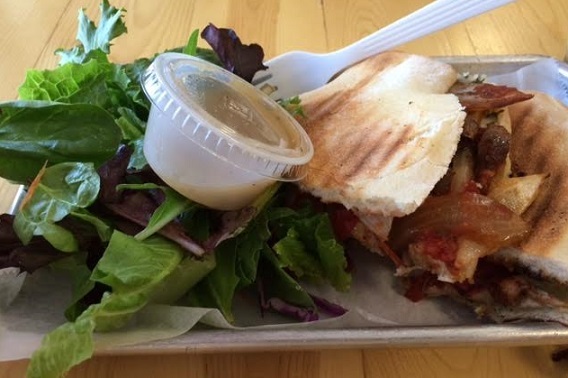 It’s one of the more affordable restaurants there, falling into the fast-casual category. 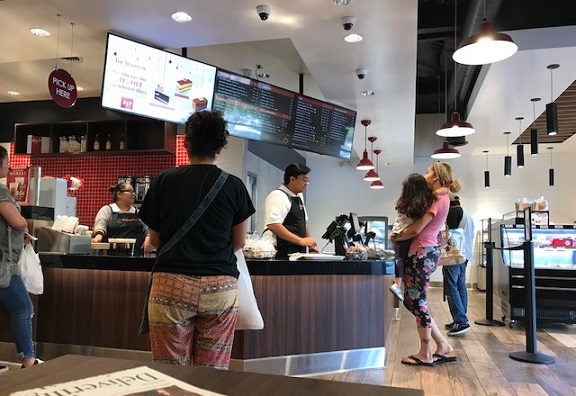 A purveyor of sandwiches, soups, salads and pasta, not to mention fresh bread and other bakery items, Corner Bakery is similar to Panera, except for the pasta, and similarly priced $1 or $2 above what you’d like to pay; a sandwich and drink will run you about $11. Still, it’s a lot cheaper than a sitdown meal at, say, Lucille’s or King’s. A friend prefers Corner Bakery, I prefer Panera. 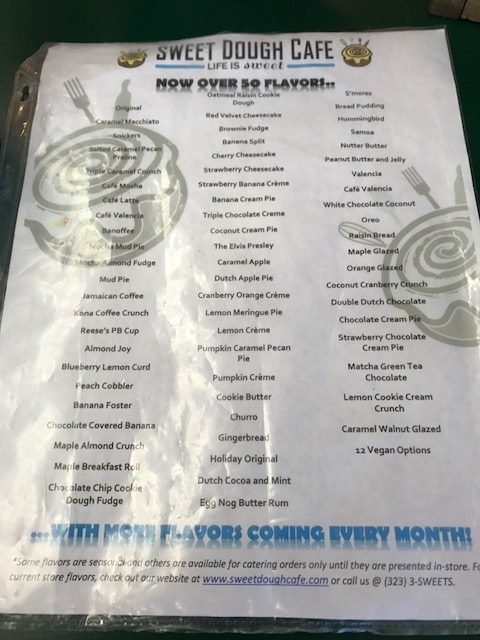 The Corner Bakery menu (view it here) is awfully complex, with a lot of items (I count 21 sandwiches and 19 salads), and you can stand there like a dope for some minutes figuring out what you want. On the bright side, there’s usually a line, which buys you time. 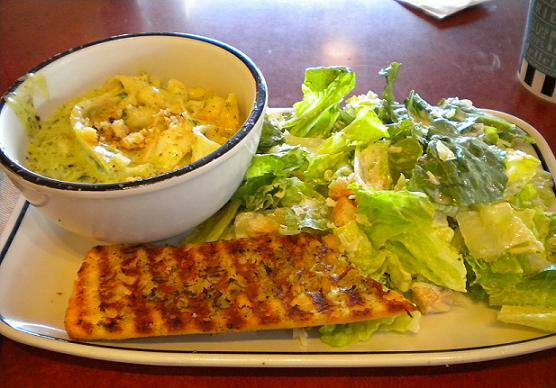 The pesto cavatappi pasta (about $8, pictured, as a “Corner Combo” as a small portion with a side salad) is a solid choice. 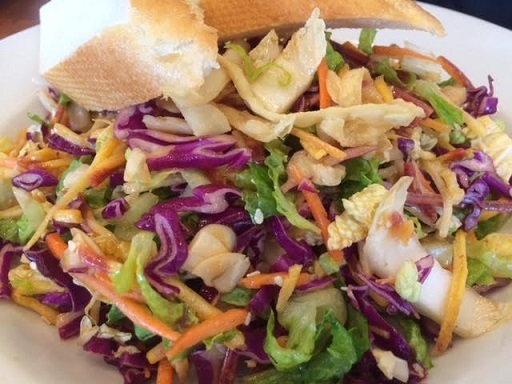 One time I got the full-size order with a side salad for $1 that, mistakenly I think, turned out to be a full-sized salad. I ate the salad and two bites of the pasta and took the rest of the pasta home for an entire extra meal. Best dollar I ever spent. That hasn’t happened again. 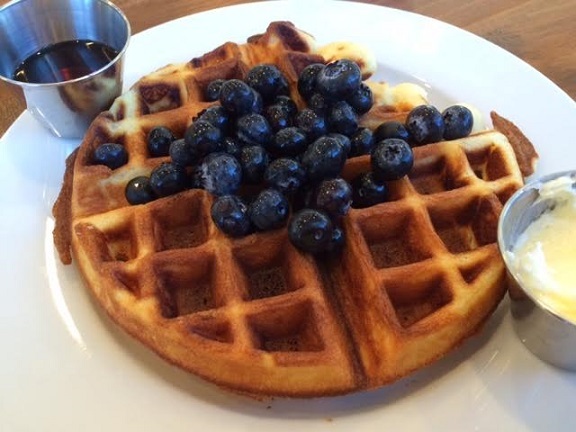 They also have breakfast, with pastries, oatmeal (including a chilled version), egg paninis and fruit bowls. 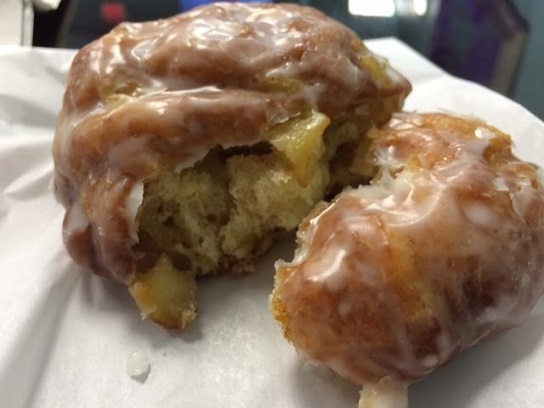 A lot of people on Yelp think the VG location is subpar, with indifferent service and crumbs on the seats. That’s never stood out for me but then I’ve never visited other, allegedly better locations. I just take it for what it is. 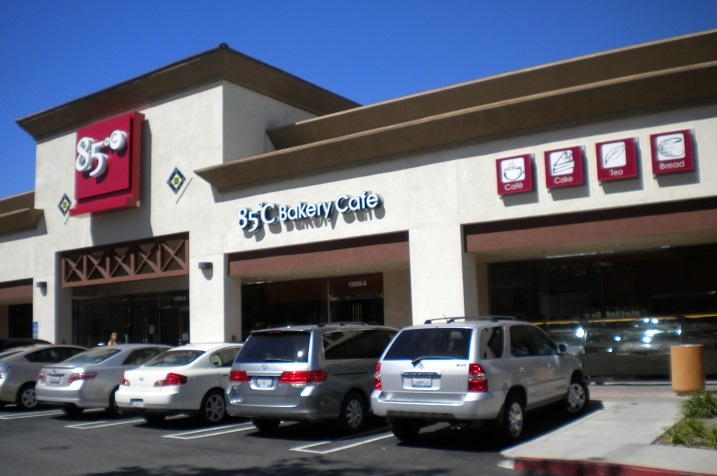 At the VG, it was easy enough to park in a surface lot nearby, hit Corner Bakery, hit Borders, hit Pinkberry (if desired) and then hit the road. I had three recent meals there during the Borders closeout sale. I like the VG, but there’s not a lot of interest for me there and there’ll be even less so without a bookstore. But Corner Bakery will be there when I need it.